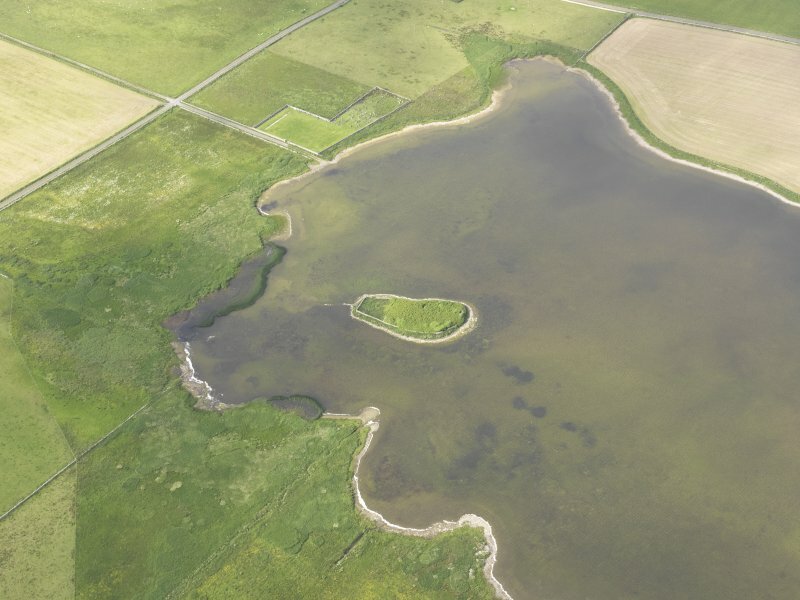 Oblique aerial view of the Loch of Wasbister, centred on the Burrian, looking N.
Oblique aerial view centred on the possible broch and chapel site, 'The Burrian', in the Loch of Wasbister, taken from the W.
A preliminary study of Orkney crannogs was undertaken in 2004. The lochs of Stenness and Wasbister on Rousay were examined, where sites had been noted that had the appearance of having been artificially constructed. In the vicinity of the Loch of Stenness are numerous important archaeological sites including the Stenness standing stones, the Ring of Brodgar and a number of cairns. The sites to be examined were at the end of the loch furthest from these remains. HY 395 334 Burrian. This large island site was examined; it supports a large walled enclosure of unknown date, which is divided into two by a cross wall. The larger of the two enclosures is completely overgrown by salmon berry undergrowth and cannot be accessed. The smaller enclosure is less overgrown but still had a significant amount of undergrowth when examined. The water around the island was snorkelled. The edge of the island had a largely artificial appearance due to the stones from which it is formed. Mostly they are the common slabs from the area, and there was no evidence of them having been systematically laid underwater. However, around the edge of the island, just above the water, there are places where walling could be recognised and it is likely that many of the slabs in the water have fallen from this possible revetment. It was difficult to distinguish in most places where the stones met the loch bed silts as there was a substantial cover of weeds growing on the loch bottom. The one area where stones could be seen in situ was the remains of a substantial causeway leading to the shore on the W side of the loch. This is very similar in appearance to the causeway noted in the Loch of Stenness and is made up of large stone slabs. It stops just before it reaches the present shore. The loch has a dam on the E side leading to the nearby sea, and the loch level is higher now than in the past. 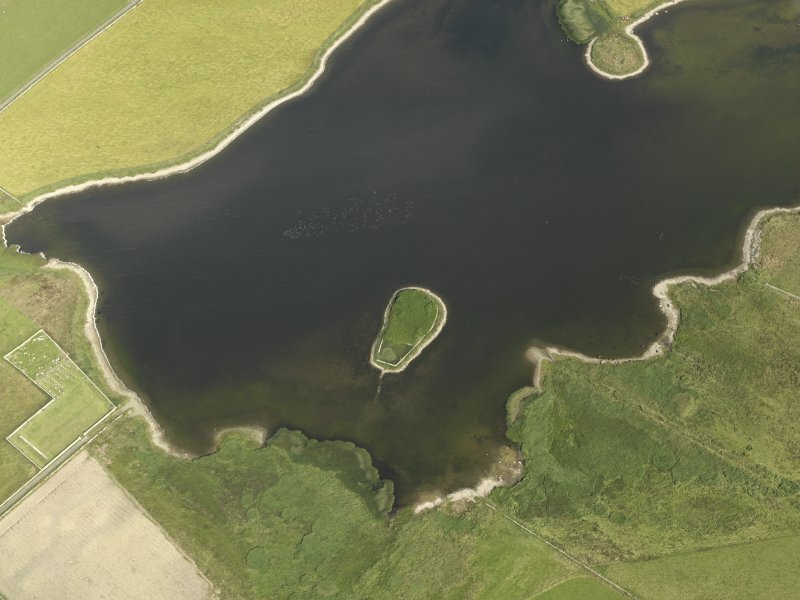 Aerial photographs, not available until after the present underwater survey had been carried out, show a number of features in the shallow water along the shore where the causeway joins it. Although this area was crossed by the team during the survey, there was no obvious evidence of the features and they may now be buried under loch bed silts. A summary of the work carried out by the Scottish Trust for Underwater Archaeology in 2004 is included in The University of Edinburgh's 50th Annual Report, 2004.